Seriously. Look at that. How could I ever not just eat all of it? Let’s face it, without dairy and carbs two of my three favorite food groups are pretty much out of the question. 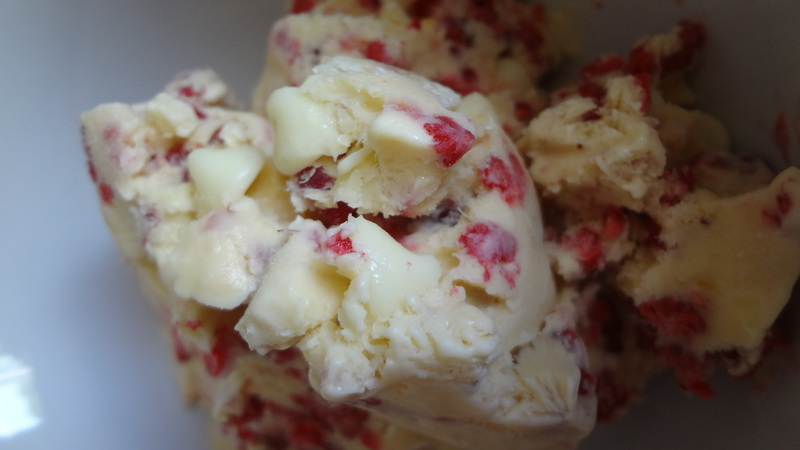 I discovered the amazing-ness of white chocolate raspberry ice cream at a tiny ice cream shop in La Crosse, Wisconsin. 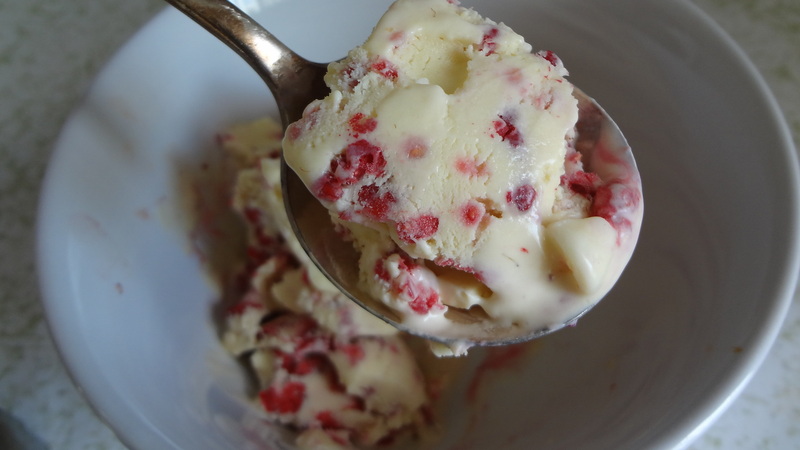 The creamy sweetness and the tart raspberries had me hooked immediately. When my boyfriend moved back to Minneapolis from La Crosse, and my weekend ice cream fixes were no more, I knew I had to find a way to recreate the flavor. And I think I finally got it. Really you guys, I think I’m super close with this one. I could never hope to achieve perfection as the original inspiration was created by a 92 year old man who still runs (and works!) his own ice cream shop. But for someone with approximately 6 months of experience, I think I’m on to something. 1. In a medium heatproof bowl, whisk the yolks just to break them up. Then whisk in half of the sugar (2 Tbsp). Set aside. Put the chopped chocolate in another medium heatproof bowl and set that aside as well. 2. In a heavy, nonreactive saucepan, stir together the cream, milk, salt, and the remaining sugar (2 Tbsp) and put the pan over medium-high heat. When the mixture approaches a bare simmer, reduce the heat to medium. 3. Carefully scoop out about 1/2 cup of the hot cream mixture and, whisking the eggs constantly, add the cream to the bowl with the egg yolks. Repeat, adding another 1/2 cup of the hot cream to the bowl with the yolks. Using a heatproof rubber spatula, stir the cream in the saucepan as you slowly pour the egg-and-cream mixture from the bowl into the pan. 4. Cook the mixture carefully over medium heat, stirring constantly, until it is thickened, coats the back of a spatula, and holds a clear path when you run your finger across the spatula, 1 to 2 minutes longer. 5. Strain the base through a fine-mesh strainer into the bowl with the white chocolate and whisk to combine. Set the container into an ice-water bath, wash your spatula, and use it to stir the base occasionally until it is cool. Remove the container from the ice-water bath, cover with plastic wrap, and refrigerate the base for at least 2 hours or overnight. 6. 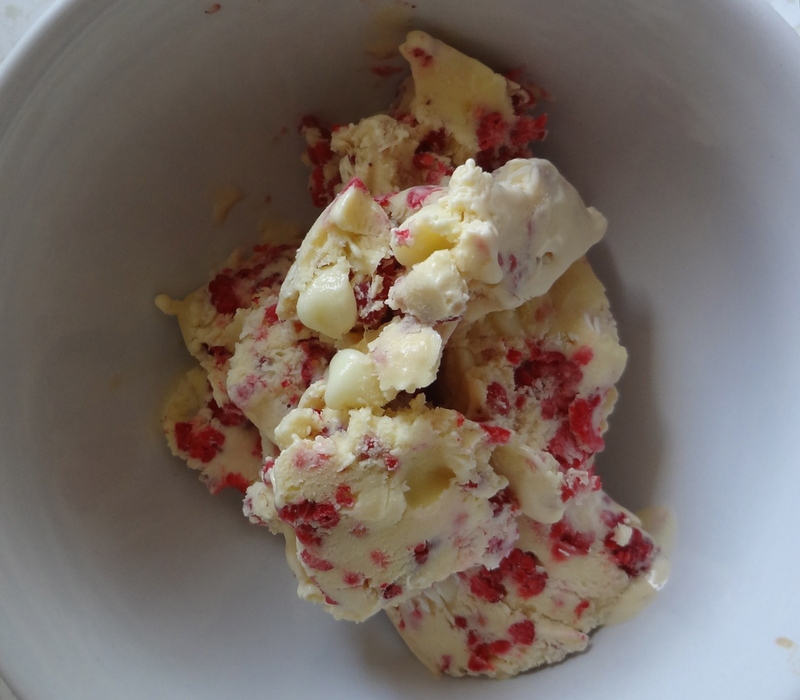 Whisk the vanilla into the chilled base and stir in the white chocolate chips and the raspberries. 7. Freeze in your ice cream machine according to the manufacturer’s instructions. While the ice cream is churning, put the container you’ll be using to store the ice cream into the freezer. 8. Transfer the ice cream to the storage container. You can enjoy immediately, or pop it in the freezer for 4 hours if you like firmer ice cream. This entry was posted in Uncategorized and tagged Desserts, homemade ice cream, how to make ice cream, Ice Cream, raspberry white chocolate ice cream, Summer, white chocolate raspberry ice cream by theculinarycapers. Bookmark the permalink. Oh good lord, when did you get an ice cream maker? We’re doomed. Doomed to a tasty death from obesity.